Welcome all to the home stretch of gift ideas. I was so clever, I wrote a bunch of posts in advance and scheduled them to publish then bam, here we reach my non scheduled posts. Did I mention it’s Sunday and I woke up today at 5 a.m. to go to work? My status update today for fb is “The more tired I am, the more makeup I put on. Today you would never guess I don’t work for the oldest profession.” Subtle, right? Pats on the back all around and then I must return to working. BUT FIRST! This is the matching necklace to the earrings we gave my sister in law for her bday. It’s from one of my neighbor boutiques Mabel Chong. 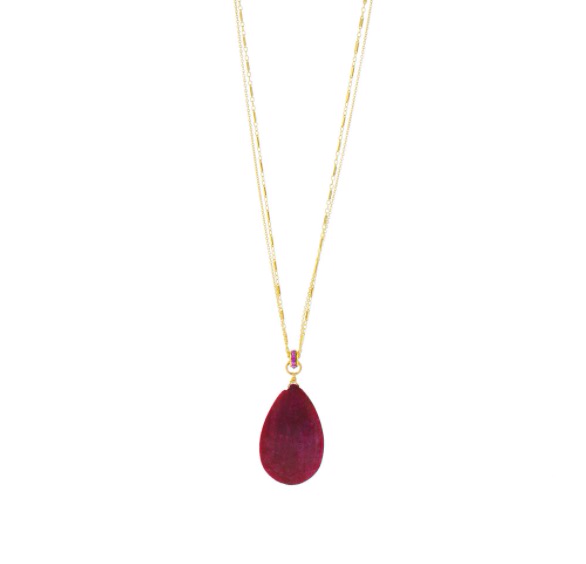 The raw ruby is so beautiful, a deep luscious magenta. Magenta is such an outdated word, isn’t it? It sounds so much less beautiful than it is. Another of my merchant neighbors is Twiga Gallery. 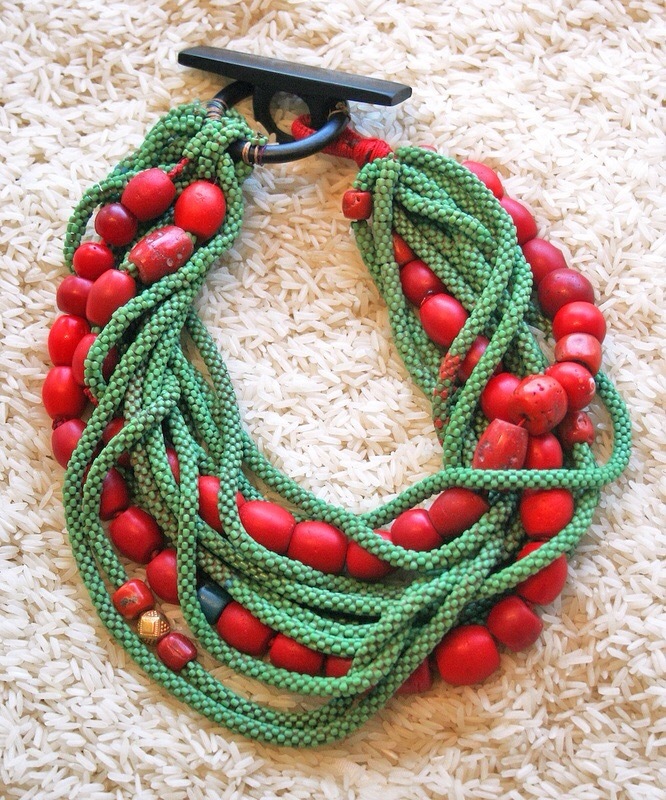 Twiga is from Tanzania and her collection of jewelry is all from various places in Africa. It’s more art than jewelry. So if you want to buy something unique, exotic, from far away lands for prices unknown…. Seriously, I have no idea what the prices are on her pieces but I know they are fancy levels. “If you have to ask, you can’t afford it.” -Chairman Mao. Just kidding. 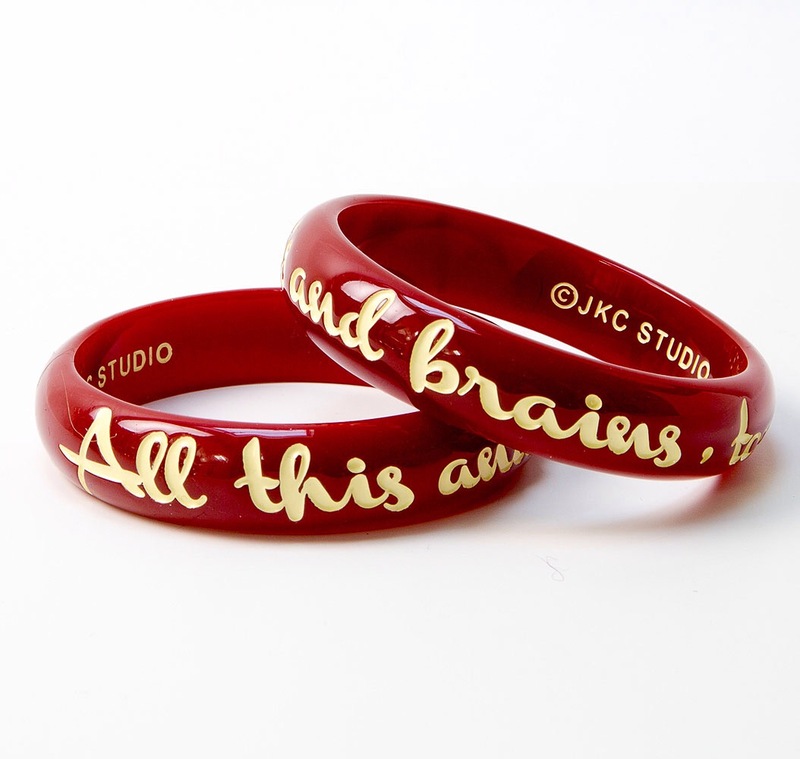 I don’t know who said that but it’s inscribed on a smartass bangle of mine. It’s one of the saying bangles 👆 same brand as above made by Jessica Kagan Cushman, a favorite jewelry designer of mine. So how’s everybody doing? You finished with your shopping yet? I still have my mom left. She wants sunscreen. So I need to figure out something better than sunscreen to give her. Sunscreen. Let me repeat that, all my mom wants for XMas is sunscreen. SMH. Right?!? Now it’s on us to figure out something special. And despite the 16 days of jewelry ideas I’m drawing a blank on my mom jewelry wise. She just gave me a ton of hers, so I think jewelry isn’t going to work for her maybe I should get her socks too? Magenta does sound old you’re right but it’s a gorgeous color. The word megenta makes me think of some ugly fabric somebody wore in 1977 or the ripped seat in a movie theatre but it’s really beautiful! It needs a new name! Exactly! But I couldn’t think if a better color name “purpley red” was kind of wordy. Megenta is pretty though & it’s not megenta’s fault that people abused it and made it remind us of weird stuff. We can bring meganta back and give it the glory of ruby and crimson! That magenta necklace is so pretty and a good staple necklace. Also a perfect gift for an Internet friend named Dora. Why can’t you and I be neighbors??! Damn geography! Yeah we would be neighbors and still communicate mostly via internets 🙂 but I would drop off egg nog first. What’s the plan for our rewatching The Walking Dead? Is there some strategy here or first one thru gets bragging rights? I know! Haha! But it would be awesome to drop by your store all the time and just become a store helper only because I hang out there so much. I’ve never tasted eggnog before! I’m planning to do it next week. And kind of see how many episodes I can go through in one sitting. I’ll probably binge watch on a Friday only because that’s my only day off from work. I hope you make TWD posts during your re-watch. *fingers crossed* It’s always nice to read someone else’s POV just in case I miss something. Ok, I will! Though I’m working basically all the time right now so it will probably start on christmas. But maybe not! Egg Nog can be either boozy or not boozy. Homemade is like drinking cream with lots of sugar and nutmeg. And raw eggs. It’s amazing. But rich. I can only handle drinking it about 1 time per year. Also, you are totally hired as shop helper/hanger outer. That’s one of the best things about my job is getting visitors at work hanging out. So agree on no schedule on TWD? I tried making homemade boozy eggnog and it did not turn out well. So I need the legit thing! Raw egg drink sound really weird though. Id be the best shopper helper. And or a good dog walker.